This paper proposes a modular and real-time actor language which addresses timing predictability through a holistic integration of an application with its operating software, i.e., scheduling algorithm. The actor language fosters a development life cycle where the same concepts and entities migrate unchanged from specification down to design and object-oriented implementation. 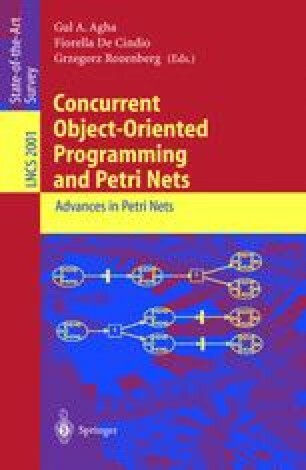 The paper concentrates on the specification and analysis of distributed real-time systems using Coloured Petri Nets. Both functional and temporal properties can be validated by simulation and occurrence graphs in the context of the Design/CPN tools. A preliminary version of this paper was presented at the First Workshop on The Practical Use of Coloured Petri Nets and Design/CPN, University of Aarhus, K. Jensen (Ed. ), DAIMI PB-532, pp. 271- 285, May 1998. Cheng, A., Christensen, S., Mortensen, K.H. : Model checking Coloured Petri Nets: Exploiting strongly connected components. WoDES.96, August 20, 1996. http://www.daimi.aau.dk/designCPN/libs/askctl. Christensen, S., Jensen, K., Kristensen, L.: The Design/CPN Occurrence Graph Tool. User’s manual version 3.0. Computer Science Department, University of Aarhus, 1996. http://www.daimi.aau.dk/designCPN/. Jensen, K., Christensen, S., Huber, P., Holla, M.: Design/CPN. A reference manual. Computer Science Department, University of Aaurus, 1996. http://www.daimi.aau.dk/designCPN/.